Andrey Karginov of Russia drives his Kamaz truck during the 10th stage of the Dakar Rally. The KAMAZ-Master team is still looking for a sponsor. The Russian KAMAZ-Master truck racing team could miss the next Dakar Rally, which will take place in South America in January 2017. The statement was made on June 14 by team leader and seven-time Dakar champion Vladimir Chagin. KAMAZ's problems are due the departure of its main sponsor, the Russian Vnesheconombank, whose contract expired in December 2015. However, Chagin hinted in a Kommersant FM radio interview that the sponsorship issue might be resolved at the Russian presidential level. Despite its financial difficulties, KAMAZ will appear at the Silk Road Rally this summer on rough terrains in Russia, Kazakhstan and China. KAMAZ will be represented by a new model, a hooded truck version that debuted in April. Driver Eduard Nikolaev, winner of the Dakar 2013 Truck Rally, will sit behind the wheel of this vehicle during the Silk Road Rally, which will start on July 8 in Moscow and finish on July 24 in Beijing. Nikolaev calls the newly assembled truck “the vehicle of the future” and also hopes to test it at next year’s Dakar Rally. 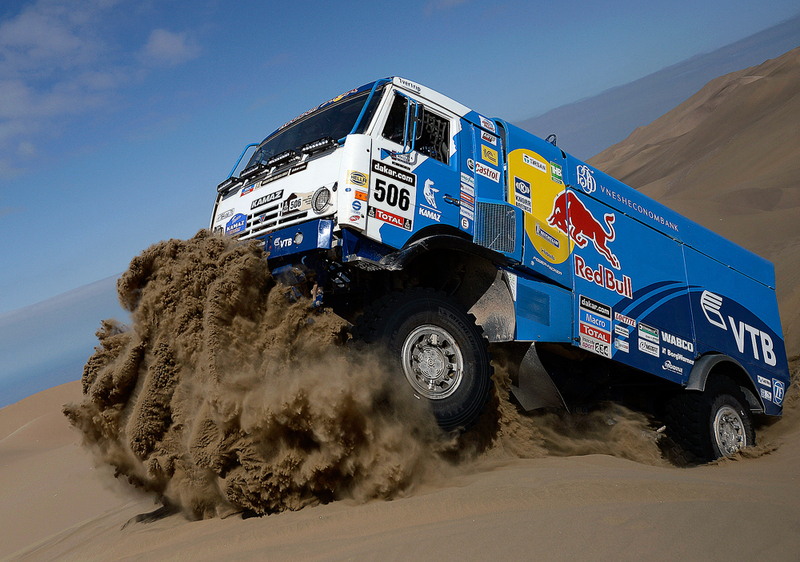 The KAMAZ-Master team has won 13 Dakar Rally truck races. Moreover, in 2011, 2013 and 2015 the team's drivers completely occupied the winner’s circle for trucks. This year the KAMAZ team headed by Ayrat Mardeev came in second place, losing to Dutchman Gerard de Rooy and the Iveco PowerStar team.